Open Source, Closed Loop: healthy, sustainable, locally grown food for Detroit. The Detroit Mushroom Factory is a collaboration born from Chris Carrier’s and Deana Wojcik’s loves of food, experiments, and all things weird. We built a farm in our North End Detroit home. The mushrooms grow in bedrooms, the basement, and the backyard. Restaurants and residents are lining up to use our locally and sustainably grown mushrooms, so we need to keep growing! 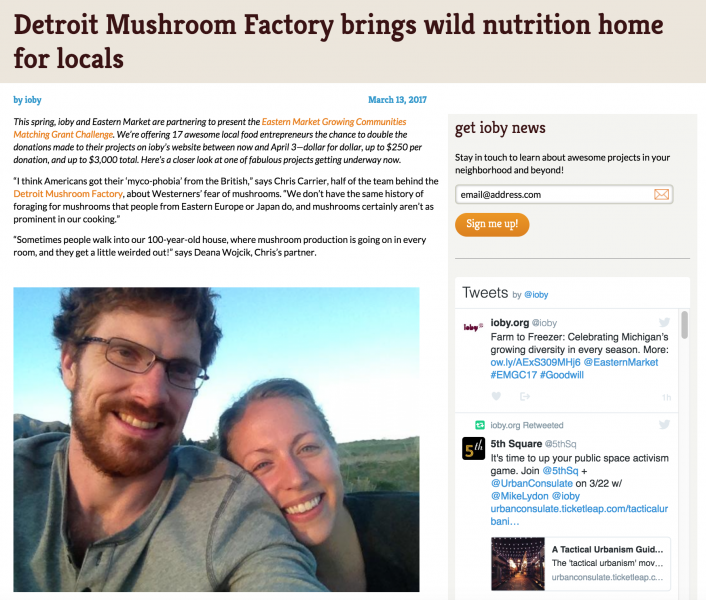 This year Detroit Mushroom Factory will move into an actual factory space. We’ve secured a formerly obsolete warehouse near our home in Detroit where we’re planning to increase production and continue to provide fresh, healthy, and affordable produce to our fellow Detroiters. We will install critical equipment for increasing the production capacity and efficiency of our farm. Phase I, to be completed by April 2017, includes dry fog humidification, specially calibrated refrigeration, mobile mushroom storage, and water filtration. These system upgrades will help to increase yields, reduce contamination, and lower energy costs, which in turn will make our mushrooms fresher, healthier, and more affordable for our customers. We believe that consumers have a right to know the origins of the food they eat—from growing practices to harvest and handling. This belief is at the root of our open source farm philosophy. We started our farm in Detroit to help move the city toward food sovereignty and promote healthy food access for all people. We make all of our practices fully transparent to consumers and we keep all of our sales local. Detroit Mushroom Factory mushrooms grow on 100% recycled materials—spent brewery grain from Detroit Beer Co. and sawdust and wood shavings from local craftsman, Richard Ganas. Reusing would-be waste materials to grow nutritious food and collaborating with other local business owners are some of the ways we put our "open source, closed loop" theory into action. Beyond the halfway mark -- THANK YOU! We continue to be blown away by the support of our family and friends. Thank you for believing in our little farm! We're close to acheiving our goal and could never have done it without you. Wow! We are so humbled and excited by the surge in donations we've received already. To our early donors, thank you, thank you, thank you!!! Your support means the world to us. #fungiisfunguys Show your support and help spread the word! #feedingtheresistance Vote with your dollars to support local and sustainable food for all. #opensourceclosedloop Take a stand for safe, local, and transparent food systems. #harvestinginnovation Blend low-tech, all-natural food production with high-tech, efficiency-driven quality and climate controls. #SporeCorps Spark true growth and expansion. Build the foundation from which others can grow.